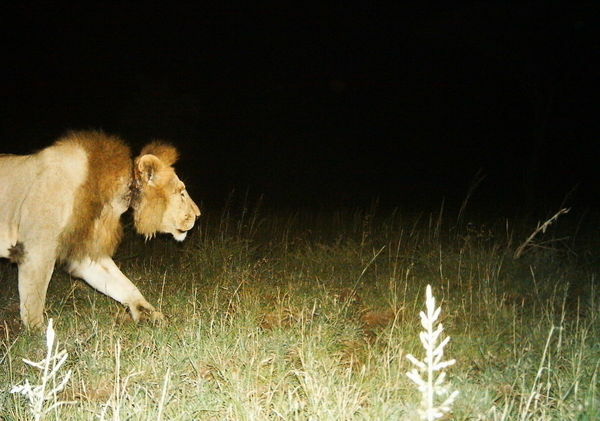 Field assistant Ingela Jansson first saw Snaran on 22-Sept 2009 together with three other males along the Ngare Nanyuki River in a favorite area for two of our long-term study prides, the Loliondos and the Young Transects. The four new males were all shy, but Ingela eventually managed to get close enough to take photos and note down their ear notches and whisker spots. These identifying marks are how we keep track of individuals. She named them Snaran (Snare in Swedish), Faran (Danger), Karan & Twaran (made-up names). Snaran had a fresh large scar around his neck, obviously caused by a snare, but it was impossible to tell if the snare was still there. Eight days later, Ingela found Snaran and his three brothers together with the Loliondo females. Ingela asked a veterinarian to come dart Snaran with tranquilizer and treat his snare wound. No wire was found, so Snaran must have wounded his neck while pulling himself free from the snare. A year or so later field assistant Daniel Rosengren asked the vets to handle Snaran a second time, because his wound wasn’t healing. They worried that a snare may still be well dug into his flesh, but a metal detector found nothing. Snaran has otherwise remained in good shape, and the four males have stayed on as resident males for both the Loliondo and Young Transect prides. The camera trap snapshot of Snaran is from March 25, 2011. Comment on it on Snapshot Serengeti’s ‘Talk’ pages.